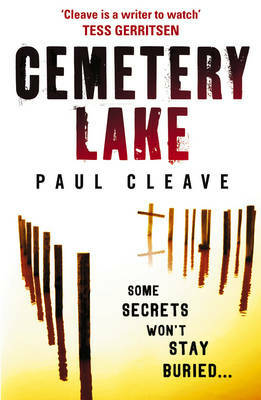 CEMETERY LAKE is New Zealander Paul Cleave's third novel. His first, THE CLEANER, was shortlisted for a Ned Kelly award. CEMETERY LAKE features Theo Tate, an ex-policeman turned private investigator, who is hired to oversee the exhumation of Henry Mathis, a bank manager, whose daughter claimed had been murdered two years ago, but it was never investigated. Now husband number two has died of arsenic poisoning, hence the exhumation of husband number one. But instead, they find the body of a young woman in the coffin, and bodies start to float to the surface in the lake. Someone has been swapping bodies but who, and why? Tate has a troubled background. His wife and daughter were hit by a drunk driver two years earlier, killing his daughter, and incapacitating his wife mentally, leading to his resignation from the police force. When he finds the young woman in the coffin instead of Henry Mathis, he feels guilty that he didn't pursue the possibility of murder two years ago, when he might have found the woman, and possibly prevented further deaths. He becomes obsessed with finding out who swapped the bodies and why, trying to stay one step ahead of the police on one hand, and the bad guys on the other, while battling with his own demons. He sinks into depression and starts drinking heavily, leading to his involvement in an accident, and his own life being under threat. Eventually he pulls himself back together and works it all out. This is a grueling novel. It is almost entirely written in the present tense, which works well to pull the reader right into the story, almost as if we were alongside Tate himself. Tate gets bruised and battered on a regular basis, and the reader suffers with him. A fair amount of the action is set in or around the cemetery, and it often seems to be raining, adding to the dark nature of the novel. The denouement of the plot is skillfully done, and includes a few last twists and turns that keep the reader guessing. If you are after a relaxing weekend read, this is not the one to pick. It is a tense and intriguing novel that will keep you on the edge of your seat.